I’m going to assume that your business is probably spending more money on acquiring new users for its app than you’d like. Correct me if I’m wrong. The cost of acquisition and the relatively low ROI most apps get from this spend are amongst the most common issues that businesses come to Swrve with. There is, of course, no quick-fix, wave-a-magic-wand solution - if there was, every smartphone user on the planet would already be using every app on a day-to-day business. What we can offer is a reintroduction to an acquisition source that is often overlooked and underappreciated, but which can lower expenditure on acquisition - and deliver a higher number of users that actually convert and bring value to the app. As if the title of this piece wasn’t a give away, I’m talking about friend referrals. So here it is: a detailed toolkit of everything you need to revamp your approach to referrals, and give your acquisition a boost along the way. Let’s start with a quick example. Below are two ways of promoting the same (very fictional) app, TechNow. 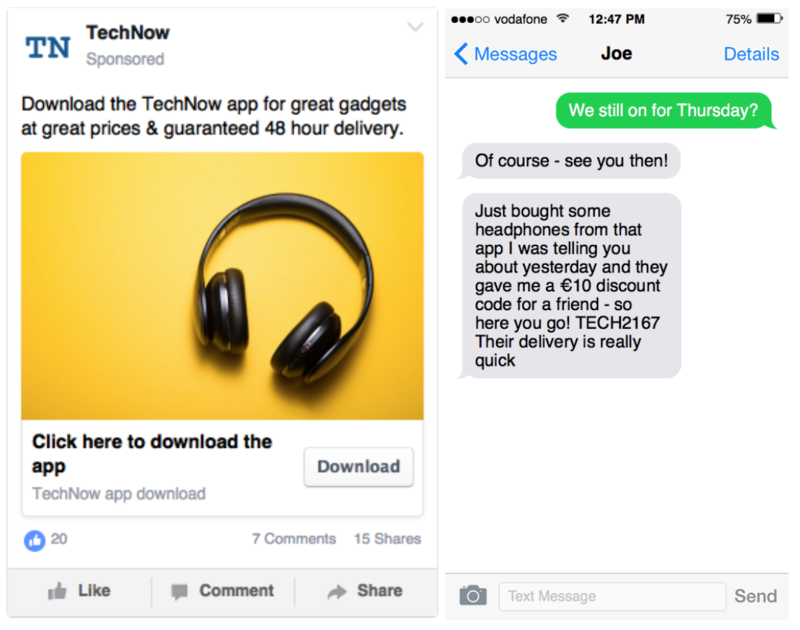 On the left, we have a Facebook ad pinging out to anyone who might have looked at buying gadgets recently; on the right, we have a text message from a friend, giving a personal recommendation and a discount for the same retail app. Which would you pick? Most of us (I would venture to say almost all of us) would go with trusty Joe there on the right and his classic example of a friend referral to tell us where we should be spending our hard-earned cash. And that, in a nutshell, is the power of friend referrals: we’re (understandably) programmed to trust the recommendations of people we know over the promotion of the company themselves, making that some of the most powerful advertising available. We’re more likely to try an app out based on a friend’s referral because we know that most people are picky about what they recommend to their personal connections, so the products and services that they do choose to share come with their seal of approval. This makes app referrals incredibly valuable - the personalized promotion they offer makes them more effective than numerous reviews and testimonials by strangers - but this is also the same reason that gaining app referrals can be tough. It’s great to acquire more users, but with churn rates for apps being notoriously high, acquiring lots of users doesn’t necessarily translate to a great ROI. What most businesses really want is to acquire more customers - the users who generate revenue in the app and bring value to the business. Friend referrals are not only an additional acquisition source for apps, they boost ROI in two ways. Firstly, they delivering new users without incurring an advertising cost, by encouraging happy customers to promote on your behalf. Secondly, the new users that download the app through referral are likely to generate more revenue: referred customers 16% more likely to continue engaging with your business, they also have a 20% higher lifetime value than the average customer. Using the mindfulness app Aura as an example, we’re going to take a click-by-click look at how their recommend-a-friend campaign works, and the key areas to develop for a successful referral program. There are two main approaches you should be looking at if you want to increase the number of friend referrals your app receives: passively giving the option to do so, with an ‘Invite a Friend’ link available somewhere in the app (like the screen from Aura above), or actively encouraging users to share their experience via dynamic interactions like push notifications and in app messages. The most successful apps use both methods - since the inclusion of a passive option is fairly straightforward, we’re going to focus on actively increasing referrals through app interactions. There can be a concern with this approach that these messages will become an annoyance to the user, and actually damage the chances of them recommending it. Follow our tips to generating targeted, user-friendly interactions and you’ll see far more uptake than from a passive option alone, all whilst maintaining a positive user-app relationship. For actively seeking referrals, the best interaction options are likely to be either push notifications or in-app messages. In-app messages are a great way to suggest recommending the app or service to a friend right when your user is in the midst of it (but hopefully not getting in the way of key tasks). Meanwhile, push notifications enable you to suggest a referral whilst the customer is outside of the app, enabling you to target users who have just completed an action and exited the app, or who have had an action occur whilst the app is closed, for instance getting a match on a dating service. Different apps and different users require different approaches, so find out what works best for your customers by A/B testing different message flows, text and imagery. It’s important to not disrupt the flow of the user experience, since this is what translates to engagement and conversion. The least disruptive referral campaigns (and therefore those that are least likely to damage user relationships) allow users to complete them in just three or even two taps, and on whichever device they prefer. Once users have clicked on the option to recommend the app, providing direct links to social media platforms and messaging apps streamlines the process, as do pre-written (but editable!) suggested messages, so users need only click ‘send’. Pre-loaded messages are a handy shortcut, but it’s also important to allow users to change them if they want. It is, after all, their friend that they’re talking to, and the customer really does know best when it comes to that. When it comes to optimizing your chances of getting a referral, timing really is everything. If you ask for a referral from someone who’s only used the app for three minutes, not only will they not want to recommend their experience, you might well see them disappear completely. If you ask for a referral from someone who’s part way through completing a complex check out procedure, you’re likely to get a similar response. Most of us wouldn’t dream of acting like this in the real world, so why should we in apps? If you were approaching someone to write an employment reference for you, you’d ideally choose someone you’d known for some time and had developed a good relationship with. In app terms, that means using behavioral data to ensure that referral request messages are only sent to customers who’ve been using the app for a while, or more specifically targeting those who’ve just had a positive experience, such as completing a transaction or unlocking new content, or who have given the app a high rating. Even with the best designed, most targeted series of interactions, including a reward for referring the app to a friend will almost always increase the uptake on your requests. Whilst some apps reward to the person who gave the referral, and others reward the person who received it, the most effective approach is to reward both parties. That might sound like double the expense, but incentives don’t need to take the form of a discount or freebie. Depending on the format of your app, experiential rewards can work equally well: referrals could be rewarded with access to more or exclusive content, early access to offers, or loyalty points. In the example from Aura above, recommending a friend earns the user two weeks of premium app access - by offering a taster of the additional features, this is also a smart way to encourage conversion to a paid subscription. To focus on building numbers of customers, rather than just downloads, for many businesses it makes sense to reward users once a purchase has been made by the user acquired through the referral. Retail app Wish, for example, requires the referee to make a purchase in order to earn both the original user and their friend a reward. There isn’t a minimum purchase amount to qualify, instead, in order to encourage higher value purchases, users are given a percentage discount that increases according to the amount spent. Asking your users to refer their friends may be treated by some apps as an afterthought, but if you follow our guide to suggesting referrals in the right way, they can help you acquire more customers, grow your users into brand advocates, and reduce your acquisition spend.